early 1900's and have been restored for your enjoyment. of viewing wildlife in their natural habitat. exclaim "look at the stars" on a moonlit night thrills all. you with the sights of the mountain wildflowers. craggy peaks are a sight to see anytime. 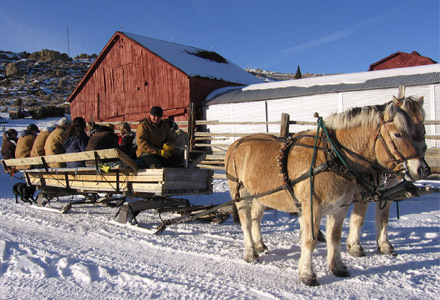 Sleigh rides last up to 45 minutes. About 11/2 hours for wagon rides. $10 for adults, $5 for children under 10. Each ride is planned individually.